Enjoy this bid with Croisian music! Welcome to Katrinnenbourg, one of the most financially powerful cities in Europe and one of the most popular tourist destinations! Katrinnenbourg is the capital of the island of Galmany, and also the capital of the province of Gavishonville. Greater Katrinnenbourg, the urban area of the city, has in excess of 8.3 million people, making it the second largest agglomeration by population in the Kingdom. The city and the urban area are both very dense. More than 4,000 people live per square kilometer on average in the urban area. Yes, even as, "this city". Ahwa: "I understand that... people around the world, those from ISC and others, have come to this room today, to witness our ISC Session hosting candidate presentation. Well, we are very honored... because this is our dream." Ahwa: "Our dream is to be a part of Simlympics. Prime Minister Mitterrand explained our reason very thoroughly when we were bidding to host the 21st ISC Session. One cannot help but feel... that the Simlympic games improve us, improve humanity so much. Since the beginning of humans, we have been fighting. Perpetual conflict and bloodshed... Perpetual suffering and chaos... The evils of humanity are undeniable. Slavery, torture, genocide, and autocracy, despite our efforts and your efforts, still exist. Unfortunately, the hope that one day everyone will cease their conflicts, and embrace their differences instead of exploiting them, as I said, is still... merely... a hope. Though, the Simlympics does so much to make that reality." Ahwa: "The Simlympics challenges prejudice with sportsmanship, conflict with friendly competition, and weapons with hurdles and tracks. We want to be a part of this. We want to engage in the Simlympics for this reason. The Simlympics is a perfect representation of what we stand for, as the European Confederation of Saint Croix, and as our goal is to replace bloodshed and warfare with peace and full unity, unity of all humans. The only difference between Saint Croix and the Simlympics on this matter, is that we will help achieve this through diplomatic affairs and the Simlympics through sports. This is our most important reason, our extreme desire to make an impact in a way that humanity is transformed for the better!" Ahwa: "Thank you, thank you! This is what we want. This is our goal. Let's achieve it!" If there is one way to describe this city, it would be "unique". Dense trees surround the city's modern financial district, Fort-de-Katrinnique, which is known to those in Liechtenstein, France, and Belgium as the "Hong Kong of Europe" for the numerous skyscrapers and high-rises in the district. Fort-de-Katrinnique is located on the coastline, and it is where the city was incorporated. Hence being a "fort", this area was heavily armed and fortified. Several invasion attempts took place here in the 17th and 18th centuries. The then-indestructible fort, however, was barely damaged and Saint Croix has avoided invasion until 1940. The German invasion of Saint Croix during WWII would mark the first successful incursion against Croisian soil since 1600s. Saint Croix has been a member of the North Atlantic Treaty Organization since 1949. The Kingdom is one of the founding members of the organization, and is also a part of the Coalition. The headquarters of the Croisian NATO Delegation is located north of Fort-de-Katrinnique. The Palace of Independence is where the Third Croisian Royal Legislature gathered for the first time in 1945. Today, the palace is the eastern boundary of the financial district. The residential/business district of Reforma is where, up to a tenth of the city's 267,000 inhabitants live and work. Unlike French or British influence in other parts of the nation, Reforma has a lot of Spanish/Portuguese influence. It is the most densely-populated area of the city. Twenty-five thousand people packed into a 3.5 square-kilometer area. The apartments here are much smaller, on average, then anywhere else in Katrinnenbourg or Saint Croix. Since the apartments are so small, they're also quite inexpensive. This area is great for small families or individual residents. Crime rate is also surprisingly low here, thanks to the city's well-funded police department. Speaking of well-funded, Katrinnenbourg is one of two cities in the Kingdom (the other being Les Canaries) whose role is more like a constituent country. 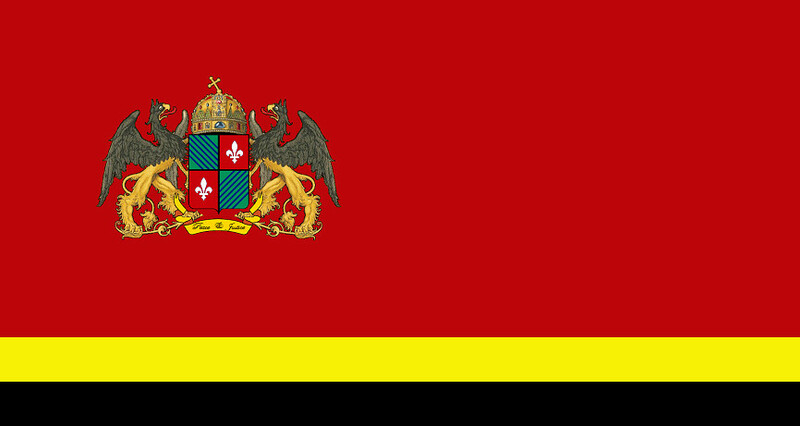 The Katrinnenbourgish estate government is allowed to earn revenues from oil reserves and state industries within the boundaries of the city. This special privilege is the reason why Katrinnenbourg is one of the wealthiest cities (and one of the cities with the highest living standards) in Saint Croix. Rapid transit is much more efficient than commuting by cabs or private vehicles. More people riding the trains means less pollution and more oil left. Up to 25 percent of the employed population of the city uses rapid transit, while another six percent rides bikes and 16 percent walks to their destination, making Katrinnenbourg a very clean (and a very green) city. Yep... the Palace of Independence! This spacious compound will be re-organized before the Session if the city is chosen. The central dining room would be filled with as many as 480 seats during the Session. The Katrinnenbourg Transportation Hub (Plate-forme de correspondance de Katrinnenbourg) is the city's central bus terminal, central rapid transit station, and the terminal of the Greater Katrinnenbourg commuter rail service. It is arguably the busiest and the largest transit center in the nation outside Les Canaries. The hub is located 1.3 kilometers south of the Palace. Unlike Reforma, apartments by the coast in Fort-de-Katrinnique are very expensive. You won't get a two-bedroom apartment with a view of the bay for a low price here. Ville des Pays-Bas (literally "the Netherlands City"), is located in Reforma, and is a very small area of the city. 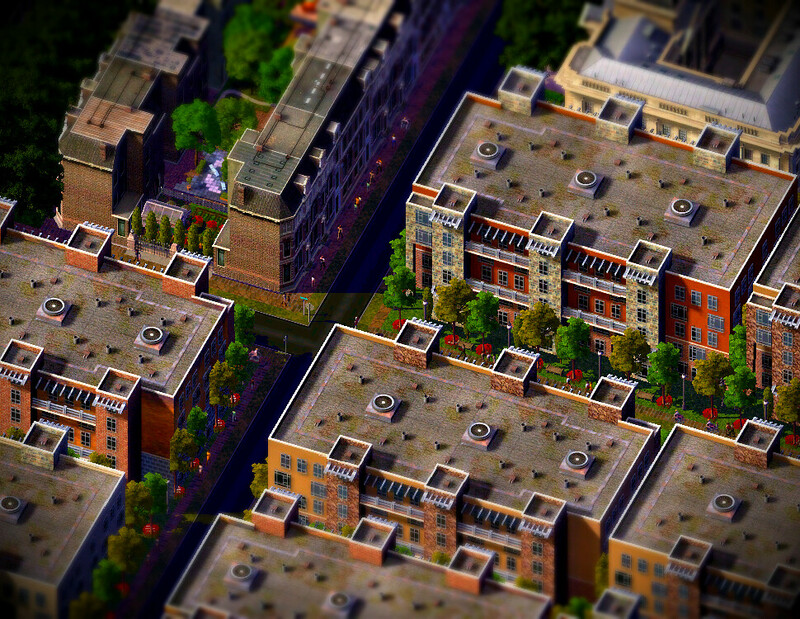 The apartments shown here are only a section of Ville des Pays-Bas. Lofts and high-rises in Fort-de-Katrinnique provide spacious, comfortable living. These modern lofts are gradually replacing older apartments and houses in the city. The lofts are equipped with brand new air-conditioning systems. The AC systems can detect polluting particles in the air outside and turn on/off automatically based on the amount of pollution. During the German invasion of the nation in 1940, the German troops built walls around the Jewish neighborhoods of the city. First imprisoned in their own neighborhood, up to six thousand innocent people were then sent to concentration camps in Poland, Germany, and other parts of Europe. Ever since, the homes have not been inhabited. Today, the ghetto is a government-protected historical site in Katrinnenbourg, and is in the registry of the Croisian Semitic History Foundation. There is a small Holocaust museum in one of these blocks. Parc de Royaume, located halfway between Katrinnenbourg and Ville du Royaume, is a government-protected natural reserve. Here, the waters are surrounded by all sorts of trees and vegetation. An entire ecosystem resides here. You can find many species of fish, birds, and mammals. When you visit the Island of Malarica, you should not leave before visiting Parc de Royaume. 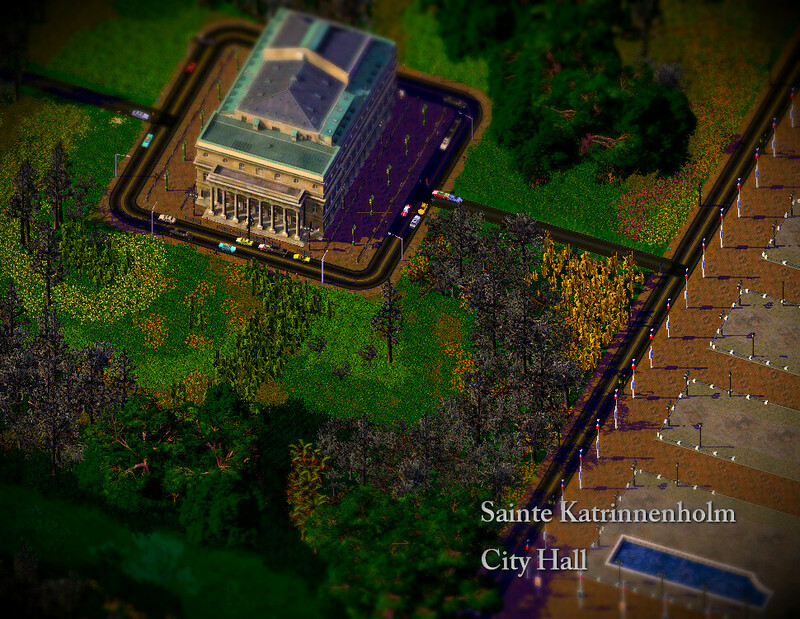 The Sainte Katrinnenholm City Hall (Hôtel de Ville de Sainte Katrinnenholm) is surrounded by an enormous "garden" of trees, flowers, and vegetation. There is even a small lake here, and the Sainte Katrinnenholm Rugby Stadium and the Malarica Museum of Natural History are both adjacent to the city hall. 01-03 Katrinnique Plaza is actually an apartment complex as well as a hotel. 01 and 02 Katrinnique Plaza's are apartment buildings. Though, 03 Katrinnique Plaza (closest to the canal) is an acclaimed, 49-story hotel. Rooms are anywhere from 200 to 600 USD per night. The Prince Hotel, located in Sainte Katrinnenholm (a suburb in the Katrinnenbourg urban area), is a four-star hotel with spacious rooms. This hotel is also less expensive than the previous two. You can actually book a room here for 80 USD per night. The catch? This is the farthest hotel from the financial district of Katrinnenbourg of the three hotels mentioned. But that only means that it's farther from the ISC Venue. After all, the Prince Hotel is in the heart of uptown Sainte Katrinnenholm, and right next to the Chinese and American consulates. Tip of the day: Use public transit. -Added to "Surroundings of the Venue"
Glad to see your Palace of Independence in another ISC Session, it appeared in the one I ran! TekindusT: Thanks a lot! BTW, what a coincidence, I didn't know Barnanova used that building, too. I'd be surprised if you don't win the 22nd ISC Session, ggamgus! It's just coincidence that someone came along that was as good as you on this for the 21st. BTW, lol, I actually came after Carl in the 21st Session bidding.